If you work for the state of Massachusetts or a municipality, and you are hurt on the job, you may be eligible for workers’ compensation benefits. Depending on your age and the severity of your injury, you may also be eligible for accidental disability retirement. The work injury lawyers at Pulgini & Norton represent Boston employees who have suffered job-related accidents and illnesses. If you are a state or municipal employee, we can assist you in seeking to maximize your compensation award. State and municipal workers often have jobs that expose them to harm. According to the Massachusetts Occupational Injuries and Illnesses Report, the state government reported an estimated 3,700 workplace accidents or illnesses in 2012. 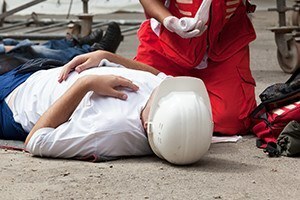 Certain types of state and municipal workers are more likely to suffer physical injuries given the nature of their job, such as firefighters, emergency responders, and police and correctional officers. Other public sector employees can also sustain workplace injuries by exposure to illnesses or repetitive stress. Hospital employees, for instance, can contract diseases due to the very nature of their job environment. The exact amount and the duration of your wage compensation will depend on whether your condition is considered a partial disability, a temporary and total disability, or a permanent disability. Wage benefits are generally between 60 percent and two-thirds of your average weekly wage for the 52-week period prior to your disability. If your employer’s insurer denies your claim or seeks to modify your benefits, you may have to go before the Department of Industrial Accidents to prove that your injury or illness is work-related, and that the medical care you need is necessary to treat your injury. Workers’ compensation benefits are often the only benefits available to injured or sick employees in Massachusetts. However, unlike private sector employees, state and municipal workers may also qualify for accidental disability retirement if they meet certain conditions. Your condition was not caused by your own serious and willful misconduct. If you are eligible for accidental disability retirement, you can receive up to 72 percent of your annual compensation. As in the case with workers’ compensation, you must report your condition to your employer. You must also report it to the retirement board within 90 days of your injury or exposure to a health hazard. Our attorneys can assess whether you qualify for accidental disability retirement benefits, and how your workers’ compensation claim could affect your ability to receive benefits. Pulgini & Norton advises state and municipal employees in the Boston area who have endured workplace injuries. Our workers’ compensation attorneys have a thorough understanding of Massachusetts laws and the process by which you can pursue benefits. As an injured government worker, you may qualify for accidental disability retirement based on your condition. We serve clients in Somerville, Hyde Park, and New Bedford, as well as other communities across the state. Call our office today at 781-843-2200, or complete our contact form to schedule a consultation.